Once you have decided what you want to accomplish through your program, you will need to choose activities that will help you to achieve these aims. It is important that Tackling Indigenous Smoking (TIS) activities are effective for achieving the proposed outcomes of the TIS program (e.g. increasing awareness of the benefits of not smoking, more smoke-free environments, increased quit attempts, reduced uptake of smoking). The best way of ensuring that an activity is effective is to use ones which have been tried and tested, so we have evidence that they work. It is also important that you choose the right activities for your local population needs and your local community context. Your role is to use your understanding of the communities in your region, your professional experience and expertise, along with your knowledge of the evidence to put together a suitable set of activities. Evidence is the information or knowledge about ‘what works’ which can help you decide which activities you will use. Evidence comes from many different sources including published research, and many professionals value this kind of evidence the most. However published research about TIS activities is not always available. Local evidence that an activity works also has an important role to play in the development of TIS activities. This is one reason why the careful monitoring and evaluation of local activities is an essential part of the TIS program. Collecting accurate and thorough local data will help you to see what works best and this information can then be used to improve your activities. You can also share this with other TIS-funded organisations and contribute to the evidence on what works for TIS. Sometimes collecting data can be challenging – the number of participants in a program may be small, or it may be that it can take a long time to see changes in smoking behaviour in the wider community. The NBPU TIS can support teams to address these and other challenges in order to develop the evidence base for TIS. It is important to remember that the evidence does not provide a set of fixed solutions (it is not a ‘recipe book’). It is one element in an ongoing process. 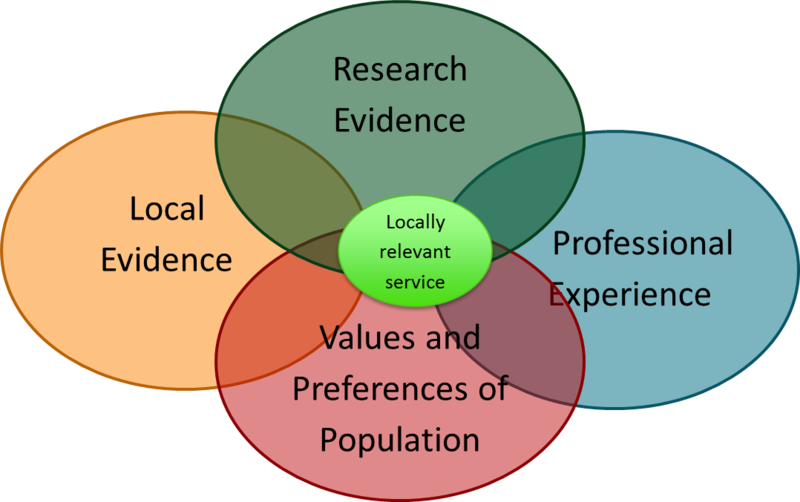 Your decision making will draw on your professional expertise about TIS and the local community with the evolving local and research evidence to develop a locally relevant service (Figure 1). What is the current best evidence to support the reduction of tobacco use? Stopping smoking by current smokers is the best way of reducing tobacco-related harm. Individuals may make several quit attempts before successfully stopping smoking for good. This is why health promotion activities and community development to support quitting are so important; it’s about continually reminding people of the importance of quitting and informing them about where to get help. It is important that as well as providing education about tobacco harms, organisations providing health promotion activities are able to refer people who want to quit to smoking cessation support services. Being part of a wider health service system or network is therefore essential for TIS teams.